Don't miss this rare opportunity to work with Annie Guilfoyle, an award-winning garden designer from London, England. In this information-filled, two-day workshop, Annie introduces students to the design process and problem-solving techniques, leading to a basic conceptual layout for your garden. Through discussion, hands-on designing, and individual direction, learn how to assess your site, where to find inspiration, and how to turn your dreams into a workable garden plan. The program also includes an introduction to making wise plant selections, using the gardens at Mt. Cuba for inspiration. Leave with a plan in progress from which to continue your design concepts. This clinic is suited to homeowners who want to redesign their garden, people working in the garden industry, and landscape designers. 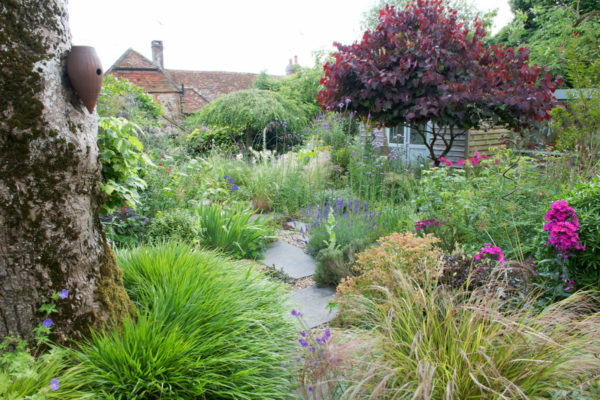 Annie Guilfoyle is the principal of Creative Landscapes in West Sussex (UK) and an RHS Chelsea Flower Show Silver Medal winner. Her design style varies from contemporary to traditional and urban to rural. She teaches at Great Dixter and West Dean in the UK, lectures throughout Europe and the USA, and is a regular contributor to Gardens Illustrated. With Noel Kingsbury, Annie established Garden Masterclass, one-day workshops taught by some of the most innovative people in the gardening world. She sits on the RHS selection panel for show gardens and judges at garden shows in Denmark, Italy, and Russia. Please review this Materials List before the first class. This class qualifies for the following professional credits: 2 CNP credits with DNLA, ISA, and 7 NOFA AOLCP.